If you are reading this, you’re not normal. The fact that you would be interested in reading a post like this places you squarely out of that part of the bell curve where most people reside. To them, the title of this post might resonate as paranoid or foolish – or not resonate at all. ‘Somebody has way too much time on their hands’ they might say to themselves, as if I was questioning the length of an inch. While I think someday I could write a book about calories – particularly ‘food calories’ as invented by Wilbur Olin Atwater – right now I wanted to put forth a relatively simple proposition: while there is much debate about whether calories matter, in the larger picture this debate is meaningless. While people interested in nutrition debate if and how calories count, regular, ordinary people who do not spend their time on such things and decide to try to lose some weight count calories. And regardless of the outcome of this debate, one aspect of calorie counting would probably not be denied by any side in the discussion: counting calories allows food manufacturers to sell food with no nutritive value. In marketing, the art directors decide the size of the biggest fonts. The lawyers and regulators determine the size of the smallest font. In the image above, look at the size of the ‘100 cal’ on the box. To take up that much real estate is a clear indication that the cookies in the box are not trying to make the sale because they are tasty, because the manufacturer is known for quality, and certainly not because the cookies are nutritious. What moves these empty calories off the shelf is the boast of only 100 calories. Yes – there’s a nutrition label – on the side – and an ingredient label – both in the smallest type allowable by law. But if you’re over 40, better have your glasses with you – especially for that ingredient label. Now – why, exactly, am I getting my shorts in a twist here about 100 measly calories? What’s the big deal? This is exactly why food manufacturers love calories – they completely divorce what is actually in the food you put into your body from a measurement that a lot of people use – for better or worse – as a benchmark for what they should put into their body. Yeah – they give you the complete nutrition info and ingredients – but only 60 percent of people actually read the nutrition labels and fewer understand them. Even fewer must read the ingredients. And if you buy into the notion of using calories to watch your food intake, about the worst thing you can do to yourself (unless you’re a numbers freak and love to calculate stuff) is to cook your own food from scratch. Let’s say you want to deep fry your own chips, for example. You buy high temperature oil and pour it into the deep fryer. Slice the potatoes, and fry them up, lay them on a paper towel to soak up the excess oil, then eat a dozen. How many calories was that? Well, you can find out that a medium potato is about 160 calories, and a teaspoon of canola oil is about 120 calories. But you deep-fried them in an entire bottle – how many tablespoons are in the chips? I suppose if you’d like to find that out you can pour the remaining oil into a measuring cup, and if you knew how much you started with, you can subtract that number of ounces from what left and find out you used 4 fluid ounces. So you see, marketing designed to encourage counting calories is carefully designed to drive you toward processed food. If you eat unprocessed food, you’re more likely to eat way better in terms of quality and without a load of preservatives and pesticides – but you won’t be able to count calories all that well. So maybe no matter who wins the debate on whether calories count is missing the point entirely? Maybe we should stop counting calories because it leads to poor food choices? I think it’s so sweet the way you think ordinary people count calories. ;)I’d say it’s far more accurate that ordinary people shovel in McNuggets and bread bowls and cupcakes with french fries sprinkled on top, with nary a thought to the calories at all. Then they go to the doctor for a pill to fix their diabeetus/GERD/PAD/whatever. Big Food and Big Pharma are then appeased. It’s the Circle of Life. Crap, I just realized I better say that wasn’t a slam on you for taking Metformin when you need it! I was really happy when I saw how you had started that and that it is working so well for you. I myself have a lifetime of antidepressant use to look forward to, and whereas it was like pulling teeth to get me to accept a daily medication, now I look back and smack my stupid head over how ridiculous it was to balk at taking something that helps me be a functioning human being. Oh yes, so much better to be smug and use diet and exercise alone instead of adding in a prescription and still be unable to focus, get through daily living tasks or interact with other people without biting their heads off. I was talking about the mindset of willfully doing damage to their bodies in the expectation that a magic pill will come along and make it all better. I take full responsibility for getting you all in a froth here. Every one of my posts are ‘abandoned’ rather than ‘finished’. Each and every one never lives up to my own expectations. I thought I was clear on this one. People who decide to do something about their weight usually start counting calories – and usually fail to do much. It’s only after a lot of wasted effort that they come to realize that the things that scream the loudest ‘lose weight!’ in the marketplace only lighten their wallet. Magic bullets are attractive…they all promise fast results – and I’ve never heard on one that works. I think that’s something we all have to learn for ourselves, unfortunately. At to conspiracy theories, we should share our favorites sometimes. Unfortunately, no conspiracy need happen here: people like tasty, cheap food. Businesses create this food. People eat it, get sick after enough years, and then doctors and medicines – businesses – try to fix them up. That’s not a conspiracy – that’s capitalism. Now you are speaking to something that I am becoming quite passionate about. I do count calories (and weirdly enjoy it) because I know that when I don’t I am naturally inclined to eat more and it effects my weight loss. But as I have said I want to know that the calories I am getting are the most nutritionally dense calories I can lay my hands on. That is generally unprocessed foods. I would tend to see what the calories are, what nutrients it is providing, and then go from there. But I can guarantee that eating those cookies is taking 100 calories away from your daily total and in return it is giving nothing worthwhile. I don’t mind at all counting calories for unprocessed foods and it only takes about 15 mins a day? Either I’m doing something wrong or right? . I count calories, too, and aside from the current crapfest of foods I’m eating at present, I too try to focus on nutrient-dense foods. The problem is I find myself cooking less – and I think part of the reason is because it’s so damn hard to do an accurate calorie count. It took me a while to count without getting too hung up on the number, but there’s an unconscious urge to be as exact as possible – and those 100 calorie nutrient-free cookies leave me confident I didn’t mess up the count. In case I wasn’t clear – I think you’re doing it right. Until some measurement better than food calories come along, it’s all we got. Did you know stevia is sold to farmers to fatten livestock? Listen: I think ‘crutch foods’ are great as people transition off a lifetime of bad food choices. I drank diet soda like a fiend for 8 years until I gave it up (mostly) in January 2012. I still *like* the stuff, and maybe have some once a month, maybe – but not the liters a day I used to consume. Anyway, if one takes the long view on this and ever so slowly learns better habits, you’re way better off long-term than if the amount of effort is so great that you flame out and end up more miserable and fatter than when you started – at least that’s my thinking at present. Bottom line: if the Splenda is your crutch – use it. Make it next year’s resolution to give it up – or the year after that. If in total your habits are making you healthier, this doesn’t diminish that fact. 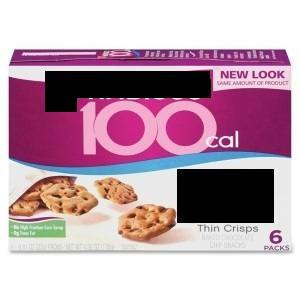 For folks counting calories, these 100 calories snack packs are way better than eating an entire box of cookies (which I have done, BTW). My point is that many people attempt to lose weight with ZERO knowlege, and while I can believe there are some people who can eat these things in moderation as part of a (mostly) healthy diet, the vast majority can’t. Really? Stevia an appetite stimulant? I don’t need that, really. Thanks!